Yahoo said Wednesday it is expanding its original offerings, partnering with Liquid Comics to offer motion-comics. The two companies said they’ll make the first two titles — created by film directors Barry Sonnenfeld and Guy Ritchie — available online later this summer through Yahoo! Screen. Motion comics blend elements of comic book art and animation, offering some movement and action but on a limited scale. It’s gained ground and popularity in recent years as publishers big and small experiment with the medium, which can viewed online or on devices like tablets and iPads. “This is compelling content from great storytellers, and we are excited to be adding Liquid Comics to our robust slate of premium content partners,” said Erin McPherson, vice president and head of video for Yahoo. 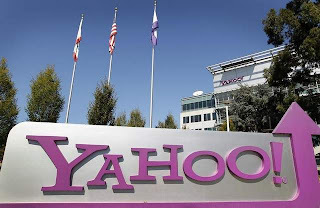 By partnering with Liquid Comics and focusing on animation, she said Yahoo is enhancing its premium original content. Together with Tom Hanks’ new animated Web series, “Electric City,” ”motion comics are the start of a unique animated offering on Yahoo,“ McPherson said. Sonnenfeld’s offering is ”Dinosaurs vs. Aliens.“ The director of the ”Men In Black“ films tells the story of aliens invading earth in prehistoric times only to face off against dinosaurs. Ritchie, whose films include ”Lock, Stock and Two Smoking Barrels“ and the recent ”Sherlock Holmes,“ will have his ”Gamekeeper“ transformed into a motion-comic written by Andy Diggle. It focuses on groundskeeper whose life is turned upside down by mercenaries. Sharad Devarajan, CEO of Liquid Comics, said the titles, along with plans for more, will help expand the reach of graphic novels and comics. ”Yahoo’s impressive global reach will greatly enhance Liquid’s goal of pushing the boundaries of comic books through digital platforms and technology and enabling our creative partners to share their stories with audiences worldwide,“ he said.